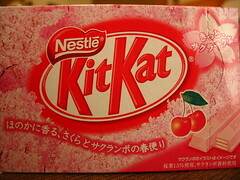 This sakura edition KitKat is available, along with those pink gift boxes (big enough for two KitKats) from ガスト, バーミヤン, Jonathan’s, and other family restaurants in the Skylark group. It’s for all those poor students currently enduring the bloodthirsty annual ritual of 受験地獄 (’Exam Hell’), a form of nationwide child abuse… err… growing up in Japan. 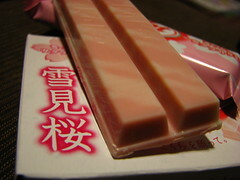 Of course KitKats are lucky in Japan – KitKat, or “キットカット” (”Kitto Katto”) sounds a bit like “きっとかつ” (”Kitto katsu”) which means ‘You’re sure to win’ roughly. And as Nestle has very sensitively been cashing in on the annual bloodsport for years, Skylark decided to join in too. 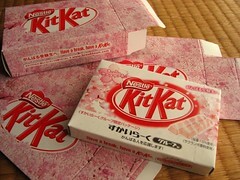 Goodness but the Sakura KitKat seems to come out earlier and earlier each year, doesn’t it. This year they admit it, but making it the ‘winter-blooming’ cherry-blossom. Er, OK. But given the limited edition nature of these things, does that mean there’ll be another one when spring arrives and the regular sakura starts blooming? The Cherry Blossom season’s just around the corner? Who are Nestlé trying to kid? There’s probably a Ministry of the Interior handbook that says when sakura season officially starts, and I’ll bet it doesn’t say January 1st. 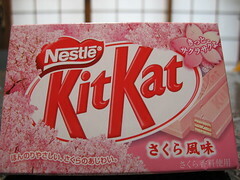 Anyway this year’s Sakura Kat is a little different from last year’s. A little. The packet’s got a cherry on it. Didn’t have that last year. And it’s a bit more cherry-y too. Reckon Nestlé were pretty proud of this one. 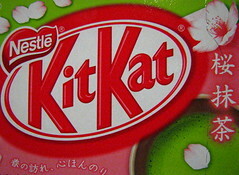 They got it into the shops long before the cherry trees blossomed and it was available for ages. Had a few of these, but a little too sweet (and let’s face it, unchocolatey) for the full 5 stars.